The report, which was prepared by the National Research Council of Canada (NRC) with input from the government of Yukon and other stakeholders, also outlines different ways an ice bridge could be created if the river doesn’t freeze naturally in the future. Freezing of the river creates a winter link between the two ferry terminals serving the local community. In the two most recent cases, an open water channel prevented the construction of the ice bridge, thereby cutting off the link between West Dawson and Dawson City. The ice bridge carries light traffic across the river as well as heavy equipment that services the mining industry. Opening dates vary considerably, from early November to early February. It usually remains in service until sometime between the end of March and late April. A gradual decrease of the yearly operational lifespan has been reported, of 1.75 days/year since 1995. In late 2017, a decision was made by the government to have Tetra Tech attempt to fill in the open water channel, using spray ice. This operation only lasted one week. 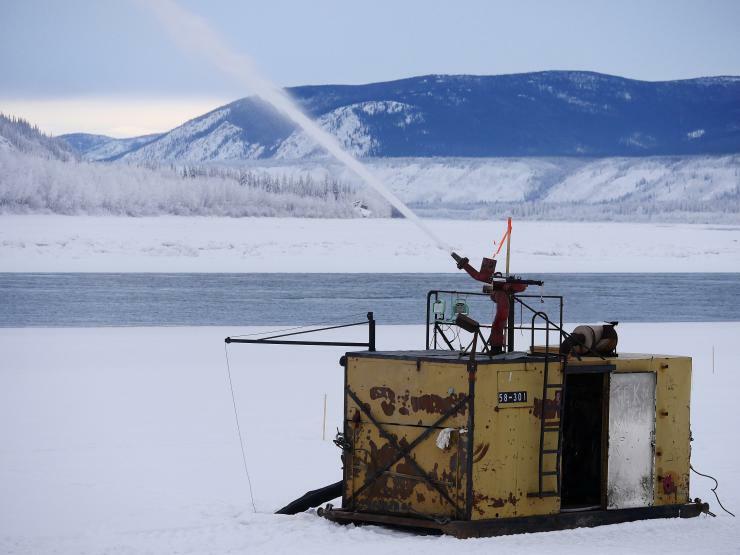 The report says that factors that played against the operation included the relatively late set-up of the contract, a warm spell with rain, insufficient knowledge of the water conditions and failure to use a boom to retain spray ice that settled on the surface. The report discusses other measures besides spray ice for reinforcing the ice. Strengthening can also be achieved by flooding the ice surface with pumps that draw water from a hole in the ice. A very different alternative is to reinforce the ice cover with a structural material, either organic - such as trees, branches or wood - or artificial material, for instance a geomembrane. The NRC is beginning a three-year test programme to identify and test an appropriate membrane for incorporation into the ice. The Yukon government will be issuing a tender this autumn for construction of the next ice bridge.